Prominent & Leading Exporter from Chennai, we offer butter cream and brown designer party wear salwar kameez, bridal wedding dresses and designer salwar kameez. We are the Leading Supplier,Trader and Wholesaler of Butter Cream and Brown Designer Party Wear Salwar Kameez in Chennai,Tamilnadu,India. We are the Leading Supplier,Trader and Wholesaler of Bridal Wedding Dresses in Chennai,Tamilnadu,India. We have achieved remarkable success in this domain by supplying and exporting wide gamut of Designer Shalwar Kameez. Versantly designed by adroit professionals, these clothes are known for excellent finishing and mesmerizing design patterns. These suits are fabricated by using high quality fabric and modern machinery, which makes them accurately stitched and shrink reistant. Moreover, these clothes are offered to customers at pocket friendly rates. 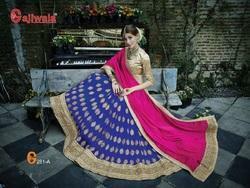 Looking for Bridal Salwar Kameez ?